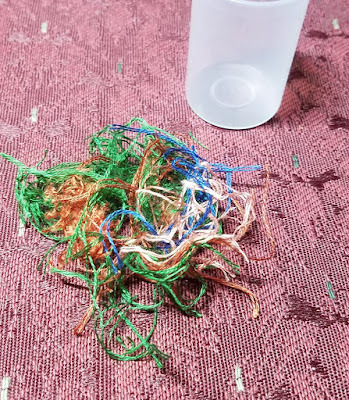 CLICK HERE to go to Sharon’s It’s Daffycat blog to read all about the Totally Useless SAL and discover why I’m posting pictures of thread snippets, otherwise known as orts. Jane Turner is the only project I’ve worked on this month and the Silly Stitching Calendar says I had 21 (!) stitching days since TUSAL check in. Still working on the wide Montenegrin stitch band, and would probably have finished it by now if it weren’t for those diagonal parts which have continued to give trouble. 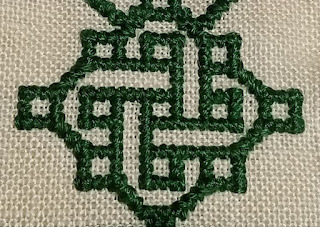 But ALL the Montenegrin stitching in this band is complete - there’s some filling yet to be done on the flowers and leaf on the right and also that knot motif and inside the long green double line, but should be able to finish it up by the end of the week (I hope, I hope). I think the knot in the center is pretty neat. The middle portion was rather cool all by itself too. It’s finally springtime here! Apparently things were just waiting for a bit of warmth – flowers and trees and have just exploded open. And the hostas – yikes! They always surprise me by how fast they grow – sometimes I think they get taller while I watch. Happy stitching, everybody – I’m so glad you stopped by today! Wow! It’s looking really great, Deb! I have the same issue with symmetry and make adjustments. 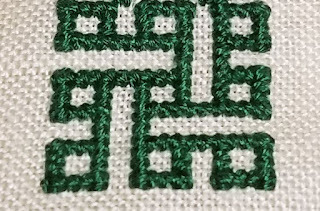 This sampler would be gorgeous with regular cross, but adding the dimension of these specialty stitches takes it to another level. One many of us will never achieve. 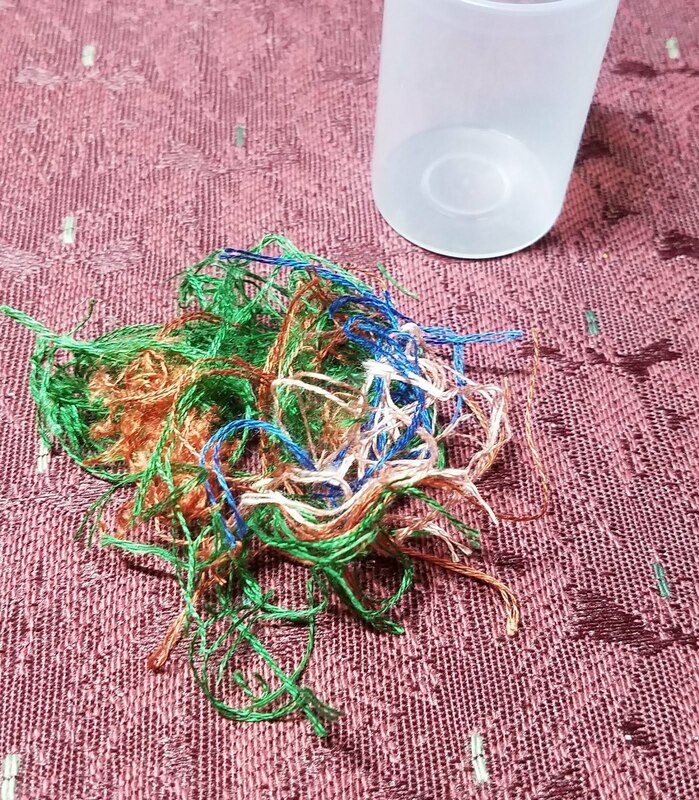 That was an intense band! But it looks so pretty. 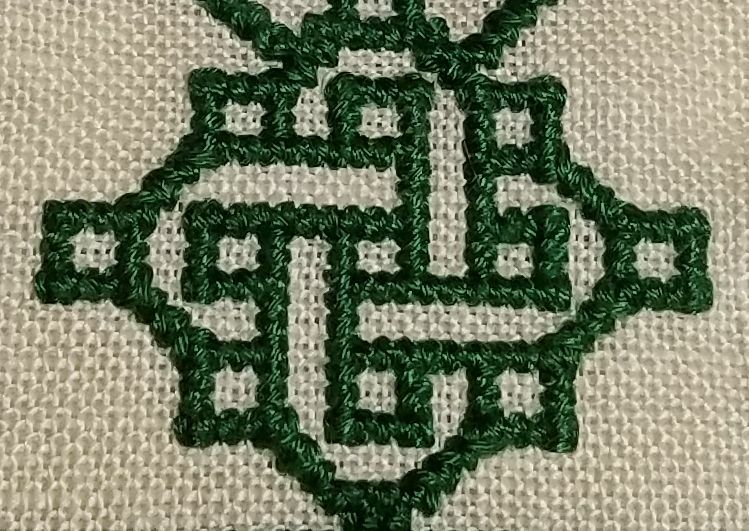 I love the Celtic knot and that stitch gives the piece so much dimension. Beutiful! Goodness Deb, this is such a beautiful band and the knot is perfect. 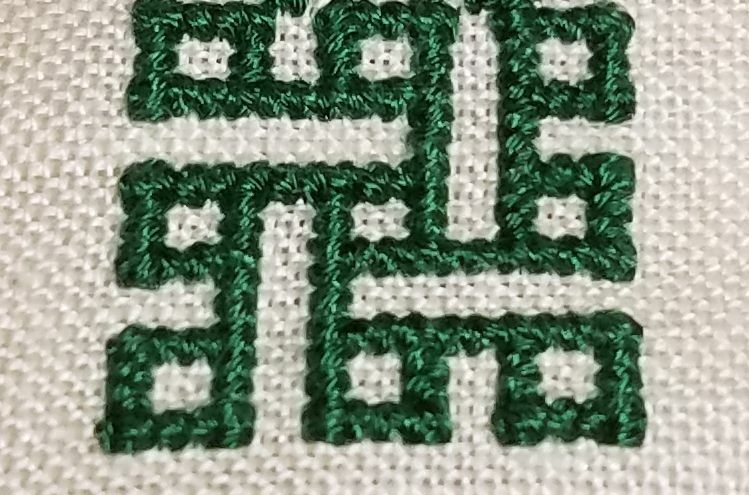 I think a lot of us stitchers crave symmetry, Deb :) Your progress on Jane is lovely and I continue to be in awe of beautiful stitching on this massive piece! Gorgeous! I admire this piece so much. Well all that effort has paid off. It's gorgeous! Wow! So much work! You are an expert at Montenegrin now! Great work. I love the little Celtic Knot. This band is just stunning. Hooray for warmth! When it warmed up here finally, things exploded too. That's okay with me! Symmetry is good for the soul!! I need warmth - Winter has finally arrived down under and I don't like it!! What wonderful work and you must be thrilled with how it has turned out. Stitching, quilting, reading, working on the house and the yard with my husband, enjoying our cats - these are my favorite things. Husband and I are empty nesters recently moved to north western Pennsylvania where we're enjoying life with our two cats. Needlework is my passion - if it's yours as well, please take a moment or two to say hello.